Welcome! If you are here visiting because of the Christmas Tour of Homes, thank you so much for stopping by! We're pleased to have you visit our home. If you are a regular reader of Reading to Know, then you are already aware of the fact that Christmas is, (just a little bit), my favorite time of the year! I have been looking forward to this Christmas with much anticipation. It is lovely to end this year on a celebratory note and we've been doing our best to do exactly that as 2009 comes to a close. 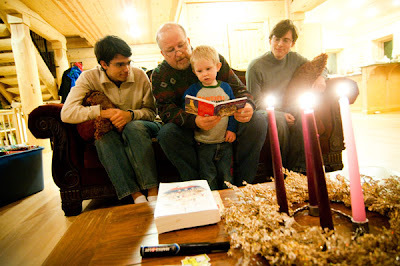 We snapped this picture of my dad reading the Christmas story to my then two year old. Sitting next to him, on the left, is my brother(-in-law), Landon. Neither they or we knew that last Christmas was to be their last Christmas here on earth. Now, I'm not trying to be all morbid here or make you feel too sober. All I merely want to say is that it's very true that you don't know which Christmas is to be your last. Our family members were taken from us suddenly, and both without much, if any, warning (dad to cancer, Landon to a car accident). So we're celebrating for more than a few merry reasons this year. We're celebrating because we have great hope for the future. As you enter our home via pictures online, I hope that you will feel cozy and at rest, ready to sit back and think about all that God has been doing in your life this year and all that you have to truly celebrate and thank Him for. 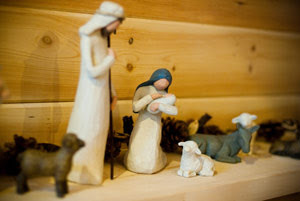 This Christmas we say: "Lord, You are SO good to us! Thank You for showing your faithfulness to us as we walked through 2009. Thank you for preparing us for 2010. Thank you for showing us that celebrations aren't just for fun (though they are for that!) but they hold great meaning. Help us not to take for granted the moments and celebrations You have graciously given us. AMEN!" Now for the tour itself! 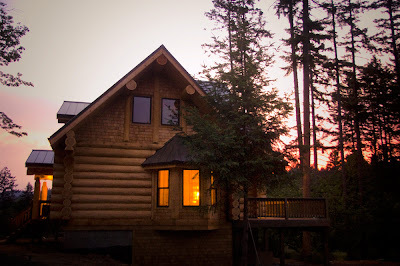 If you drove up our driveway, you'd probably be greeted by an exuberant three year old, who would be eager to welcome you into our log cabin home. He'd be the most excited to show you our tree, which he played a role in helping to decorate. The little square White House Christmas ornament is special to me because it was given to me by a dear friend of mine who lives in D.C. Putting it on the tree and looking at it this season reminds me of her, how much I MISS HER, and how excited I am to be seeing her right after Christmas when she comes to visit!!! HAD to have the library. 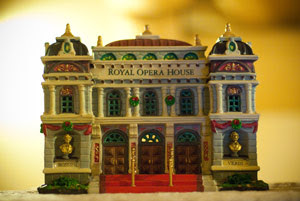 ;) The Royal Opera House is for (my husband) Jonathan. Have a blessed and very MERRY CHRISTMAS! Thank you so much for stopping by and visiting! OH, I wanted to do this. . . and maybe I still will, if I can get any decent pictures tomorrow. Thanks for sharing! Love the Christmas village, it's all so pretty! Merry Christmas! Merry Christmas to you too! Love your Christmas village! It looks great! 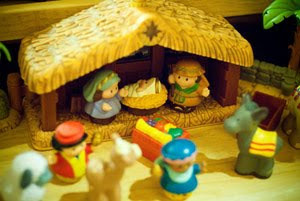 love the nativity scenes! i need to get one! Your house is beautiful!! The view "driving up" is stunning! And just as a side note, I'm an avid reader myself but I never knew there was a "Book Blogs" group! Wonderful! I learned some new things about you! I didn't know you lived in a log home! There was a time I wanted to, but I've kind of changed styles now. I don't think I knew you went to law school. 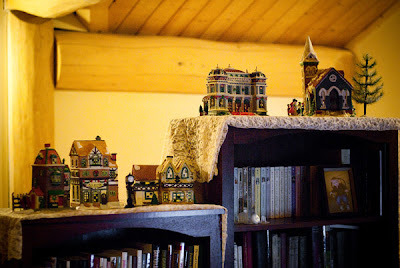 The Christmas village pieces were such a great find, and I love that you found pieces that correspond so well to your family. Your book arrived today! Thank you! I really liked seeing some of your special ornaments! And I like how you chose the most meaningful pieces of the Christmas village for your family. Very sweet. I love that you have a log cabin home! It looks so homey and warm. Love your home! Love your tree and your Christmas tour! So fun to have discovered so many wonderful blogs through the tour. Merry Christmas! Does it get better then Christmas in a log cabin? LOVE your village! I have always wanted a village! Beautiful! And I love the picture of your dad reading to your little guy. Precious and priceless. What a story, it completely touched my heart and stopped me in my tracks. I'm so glad you were able to capture such a beautiful photo! I'm sure you will treasure it forever. Your home is so warm and inviting too. 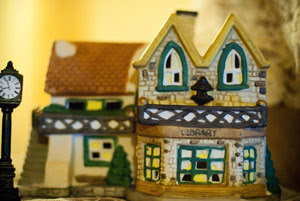 I also love the idea of collecting village houses that have significance-great idea! Thank you so much for sharing this photo and for reminding us that our time here is a precious gift. Beautiful. Just beautiful! 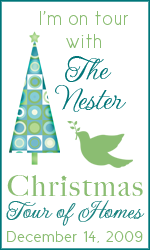 I am stopping in from Nester's place. To see my tour click on the 'Christmas 2009' tag on the left sidebar of my blog.